Objective : Pseudocatalase/superoxide dismutase (PSD) is a topical gel considered having therapeutic effects in vitiligo. This study was designed to evaluate the efficacy of this combination in vitiligo. Methods : This was a pilot randomized, double-blind, placebo-controlled trial on 46 symmetrical vitiligo lesions of limbs in 23 patients referring to dermatology clinics, Isfahan, Iran in 2010. Patients were received this formula or placebo gels for the right and left lesions. Lesion area and degree of pigmentation were assessed at baseline, 2, 4, and 6 months. Findings : There were no significant changes in lesion area and perifollicular pigmentation in each group (P > 0.05). Conclusion : The results indicated no significant therapeutic effect for PSD in vitiligo. Inasmuch as there are controversial results on the effectiveness of pseudocatalase cream in vitiligo treatment, this study was conducted to determine the efficacy of a formulation containing Cucumis melo superoxide dismutase (SOD) and catalase in the treatment of vitiligo. This pilot randomized, matched-paired, double-blind, placebo-controlled trial was performed in outpatient dermatological clinics in Isfahan, Iran in 2010. Inclusion criteria included having bilateral vitiligo for at least 12 months, no white hair on depigmented lesions, and no perifollicular pigmentation. Those who had unstable vitiligo, thyroid disease, and diabetes mellitus or have had any topical or systemic therapy within the last 4 weeks were not included in this study. Considering α = 0.05, study power = 80%, and expected improvement for pseudocatalase/superoxide dismutase (PSD) as 63% versus 20% for placebo, the sample size for each group was calculated as 21 lesions. These 21 patients were selected consecutively and each patient acted as his/her own control. Ethical approval based on the Declaration of Helsinki was obtained from the Isfahan University of Medical Sciences Ethics Committee and all subjects gave written informed consent. Two similar square-shaped lesions in the limbs, one on right side and the other on the inverse side, were selected to apply either placebo or PSD gel. Patients were alternately allocated to receive PSD or placebo gels for the right and left lesions, respectively, by a pharmacist. The PSD gel and the placebo were provided by the manufacturer (Life Science Investments Ltd, London, UK) in a 3.2-kg container. The PSD and placebo gel were packed and coded in identical containers for each patient by a pharmacist. Therefore, patients, corresponding physicians, and investigators were all blinded to the group assignment till the end of the trial. During the initial visit, a detailed history was taken by the investigator and the extent of each vitiligo lesion area was assessed manually. The patients were asked to apply topical treatments (one gel for each side) to the absolutely clean affected skin twice daily and massage slightly to allow it to penetrate the skin. Also, patients were advised to have sun exposure for at least 30 min between 11 am and 2 pm daily without sun screen or make-up. They were asked to stop application of the mentioned medications and call the physician in case of any adverse or allergic reaction within 24 h of first application of the gels. The treatment lasted for 6 months and every 2 months, the reassessment visit was done by the investigator. The extent of each vitiligo lesion area was assessed as following: The patient was asked to figure out the affected site of body in defined and specific position. Then, this position was recorded in his/her follow-up paper to figure out the same position in next assessment session in order to have precise measurement of each vitiligo lesion. The lesion's area was calculated as multiplying the longest length of each lesion to the longest width of it. Also, the scoring of perifollicular pigmentation was as following: (1) No perifollicular pigmentation; (2) perifollicular pigmentation <25% of lesion area; (3) perifollicular pigmentation 25-50% of lesion area; and (4) perifollicular pigmentation >50% of lesion area. Moreover, all adverse events were recorded. Data were analyzed with SPSS software version 15 (SPSS® Inc, Chicago, IL, Usa). A repeated measurment analysis was used to evaluate the changes in the mean extent of vitiligo lesions' area before and after treatments. A P value of <0.05 was considered statistically significant for all analyses. Twenty-three patients (20 women and 3 men) with bilateral vitiligo lesions were enrolled into this trial. 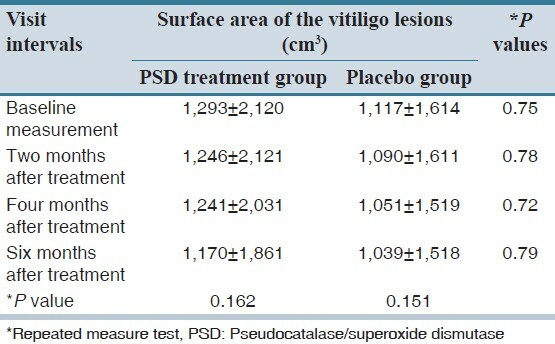 The mean extent of vitiligo lesions' area at baseline and all reassessment visits after treatment with PSD and placebo are shown in [Table 1]. According to repeated measurement analysis, the decrease in the mean extent of vitiligo lesions' area was not statistically significant during the study period in both the groups. 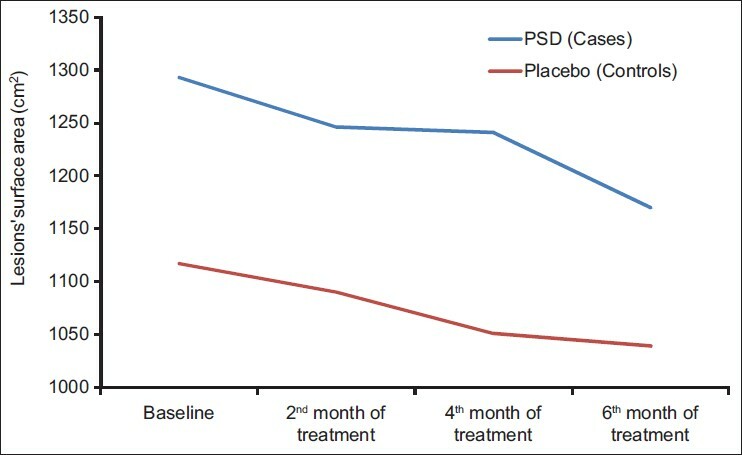 Also, no significant differences were seen between treatment with PSD and placebo at baseline and all reassessment visits [Figure 1]. No side effect was seen in none of the groups. The score of perifollicular pigmentation in each group was 1 at baseline and no change was occurred during the study in it. A plant extract formulation from C. melo, SOD and catalase (Vitix® , Life Science Investments Ltd, London, UK), has been introduced for vitiligo patients. It is claimed that this medication can be beneficial for the removal of the H 2 O 2 from the skin and consequently prevents the destruction of the melanocytes. However, there are some controversial results in this case. One of the potential drawbacks of this study was the lack of an objective measurement for repigmentation of vitiligous lesions. However, we tried our best to find a good method for an appropriate measurement of repigmentation. The use of digital morphometry or a colorimeter would allow more accurate and objective quantification of the differences in pigmentation following the treatment. On the other hand, our study has the advantage of having a self-control group which makes much more precise comparison and results possible. In conclusion, this pilot study has shown that the topical use of PSD twice daily in combination with sun light exposure is not effective in vitiligo treatment. Larger studies with more appropriated objective repigmenting measurement are suggested. All authors had active contributions in all stages of this study including data gathering, data analysis and manuscript preparation. 1. Taïeb A, Picardo M. Clinical practice. Vitiligo. N Engl J Med 2009;360:160-9. 2. Miniati A, Weng Z, Zhang B, Stratigos AJ, Nicolaidou E, Theoharides TC. Neuro-immuno-endocrine processes in vitiligo pathogenesis. Int J Immunopathol Pharmacol 2012;25:1-7. 3. Patel NS, Paghdal KV, Cohen GF. Advanced treatment modalities for vitiligo. Dermatol Surg 2012;38:381-91. 4. Colucci R, Lotti T, Moretti S. Vitiligo: An update on current pharmacotherapy and future directions. Expert Opin Pharmacother 2012;13:1885-99. 5. Hazneci E, Karabulut AB, Oztürk C, Batçioðlu K, Doðan G, Karaca S, et al . A comparative study of superoxide dismutase, catalase, and glutathione peroxidase activities and nitrate levels in vitiligo patients. Int J Dermatol 2005;44:636-40. 6. Arican O, Kurutas EB. Oxidative stress in the blood of patients with active localized vitiligo. Acta Dermatovenerol Alp Panonica Adriat 2008;17:12-6. 7. Gawkrodger DJ. Pseudocatalase and narrowband ultraviolet B for vitiligo: Clearing the picture. Br J Dermatol 2009;161:721-2. 8. Yuksel EP, Aydin F, Senturk N, Canturk T, Turanli AY. Comparison of the efficacy of narrow band ultraviolet B and narrow band ultraviolet B plus topical catalase-superoxide dismutase treatment in vitiligo patients. Eur J Dermatol 2009;19:341-4. 9. Bakis-Petsoglou S, Le Guay JL, Wittal R. A randomized, double-blinded, placebo-controlled trial of pseudocatalase cream and narrowband ultraviolet B in the treatment of vitiligo. Br J Dermatol 2009;161:910-7. 10. Sanclemente G, Garcia JJ, Zuleta JJ, Diehl C, Correa C, Falabella R. A double-blind, randomized trial of 0.05% betamethasone vs. topical catalase/dismutase superoxide in vitiligo. J Eur Acad Dermatol Venereol 2008;22:1359-64. 11. Schallreuter KU, Rokos H. Vitix- A new treatment for vitiligo? Int J Dermatol 2005;44:969-70. 12. Szczurko O, Shear N, Taddio A, Boon H. Ginkgo biloba for the treatment of vitilgo vulgaris: An open label pilot clinical trial. BMC Complement Altern Med 2011;11:21.